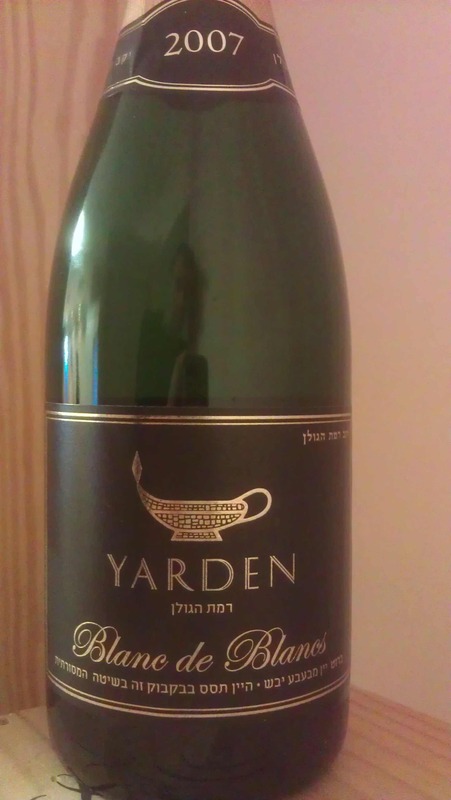 This past week, I was once again in Israel and it gave me the chance to taste the recently released 2008 Yarden Rose Bubbly, which was one of the highlights of my trip. I also finally had the chance to sit with and enjoy a bottle of the 2011 Teperberg Malbec, that I tasted at the winery, and it lived up to my hype. Finally, I tasted the recently released Yarden Malbec, and though it is a well constructed wine, it was too sweet for my palate. This past Shavuot we had family over and enjoyed some great wines, a bunch of lovely sushi, and cheeses, and a brisket dinner to boot. The sushi was enjoyed for both the first night and lunch meal. The sushi rice was messed up by me, but my nephew and I rescued it and we had some great fish to make it all work. To pair with Sushi for two meals we started with the highly conventional, and then veered way off course as well. To start we enjoyed three white wines; 2010 Carmel White Riesling, the 2010 Midbar white 44, and the 2007 Hagafen Brut. The Carmel Riesling started off really nice but quickly faded – so be careful with what bottles you have left and drink up fast. The Hagafen Brut was rocking and lovely, and the Midbar 44, was the best white and the second best wine of Shavuot. The next day we went the highly unconventional route and enjoyed two res with the sushi meal – but hey who cares, I wanted to enjoy them. First we opened the last bottle of my 2001 Yarden Ortal Merlot and then we opened a bottle of the 2009 Shiloh Legend. 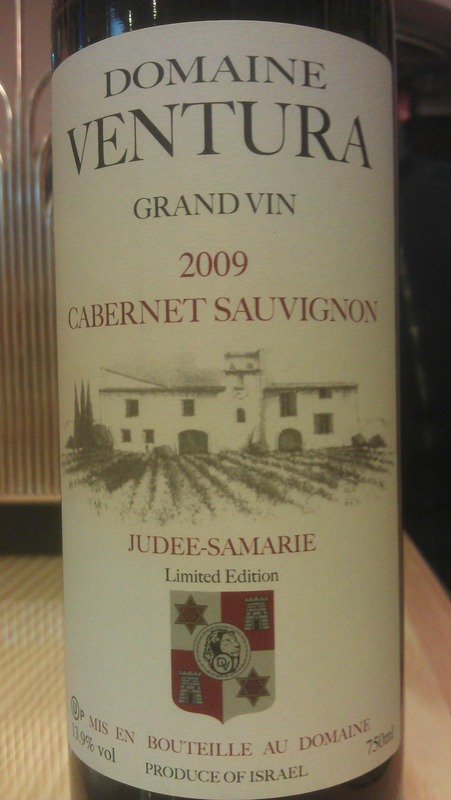 I had this wine again over Shavuot though the wine really impressed when I opened it and enjoyed it – it died a few hours later. Initially – when opened it gives you a sense of sweetness though it is bright and ripe but with little residual sugar. The nose starts off with lovely floral notes, clear peach and apricot, along with an intense citrus brightness, melon and spice. The mouth is rich with citrus, lemon, ripe pink grapefruit, all backed by a great bracing acid. The finish is long with nice mineral, slate, citrus zest, vanilla, and baking spices. This wine is in drink NOW or drink UP mode. Get it cold and enjoy within the next few months. Having brought back tow of these beautiful bottles home – it was time to enjoy one with sushi! The wine is a blend of Gewurztraminer 25%, Sauvignon Blanc 20%, Chardonnay 20%, Viognier 20%, Semillon 15%. Yeah, five grapes yet called the 44, who cares – the wine concentrate on the wine!!! This one blew me away, the aromas literally are in a cage match to the death, fighting each other tooth and nail until one becomes victorious. I did not stand around long enough to find out whom the winner would be, but in the end with a wine like this – we who enjoy it are the lucky winners indeed! Yaacov explained that Gewurztraminer is one of his hardest grapes to control, it has soapy or unwanted flavors and he does things with it to minimize the bad and accentuate the good. He does cold whole bunch press, and he blends it with all of these grapes to get the most out of all of them. The nose is redolent with super ripe summer fruit, crazy ripe orange, grapefruit, violet, rose, honeysuckle, and litchi. The mouth is rich, round, honeyed, and insane, with layers of complexity and flavors, starting with ripe nectarine, guava, green and yellow apple, all coming at you in waves. The oily texture and the summer fruit combine for a mouth captivating wine. 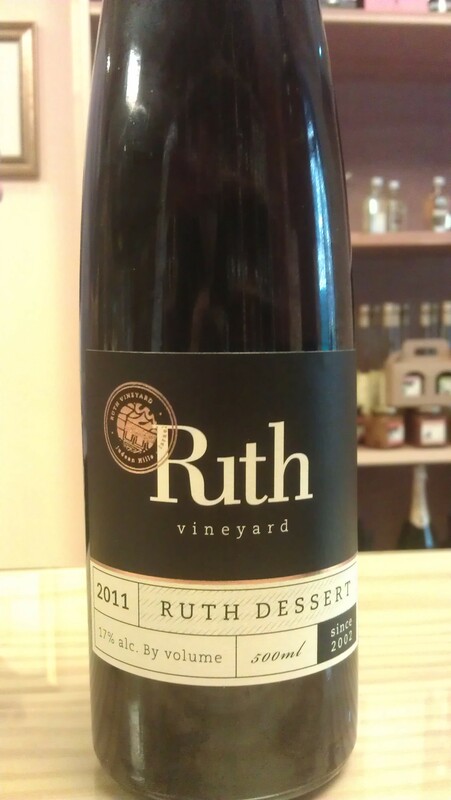 The finish is long and spicy with nuts, almonds, marzipan, tart fruit, candied grapefruit, and earthy mineral notes! The wine did not disappoint at the winery or at home! Bravo!! Love it again – wow what age can do to a sweet wine!!! I could not wait the two years I said I would – wanted to share it with family, so it was time to enjoy! What a glorious wine, the wine showed date and raisin in the past, but now this wine is round, ripe, and rich, with layers of concentrated fruit, mouth coating tannin, and rich body. The wine now shows beautifully and is a wine that we did not have time to watch open as the wine disappeared in almost no time, clearly the winner of Shavuot. The nose starts off with bright and ripe blackberry, rich dark cherry, clear herbs and green leanings that flow into good dirt, earth, and smokiness. The mouth is rich, layered, concentrated, and round, showing what the perfect balance of oak, ripe fruit, and time can create. The mouth is full bodied, and the best merlot that I have tasted from Yarden, with cassis, black plum, red currant, lovely mouth coating tannin, awesome bracing acid, and more earthiness that brings the whole mouth together, with hints of sweet cedar. The finish is long and spicy with black pepper, mineral, chocolate, rich leafy tobacco, and more dirt. What a great wine and one that is as good as it is going to get – so drink up now!!! 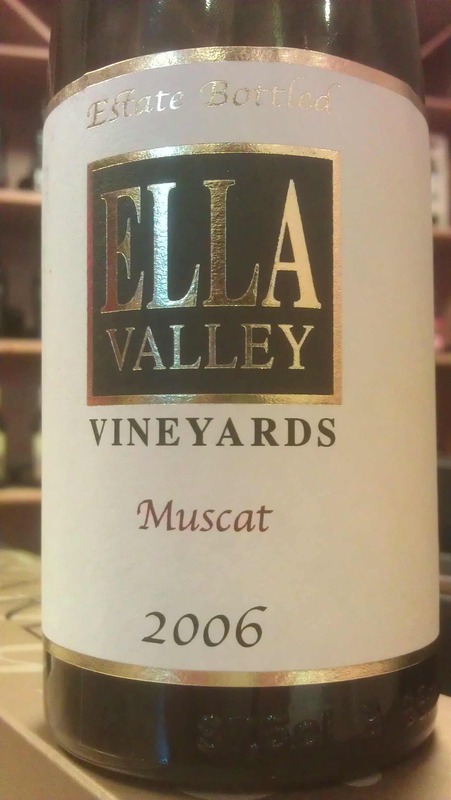 The nose on this mevushal purple colored wine explodes with ripe blueberry, dark cherry, ripe raspberry, licorice, and lovely spice, with a hint of roasted meat and smokiness which leaves soon enough for more crazy spices and ripe fruit. The mouth on this full bodied, ripe, round wine is expressive with sweet fruit, blackberry, ripe strawberry, plum, more blue fruit, along with sweet cedar, and mouth coating tannin that lingers and makes the mouth feel ripe, sweet, and round. The finish is long and spicy with nice vanilla, cinnamon, chocolate mocha, black pepper, cloves, nutmeg, and mint. Over time the wine opens further to show grapefruit, pineapple, watermelon, and more lovely baking spices – BRAVO! 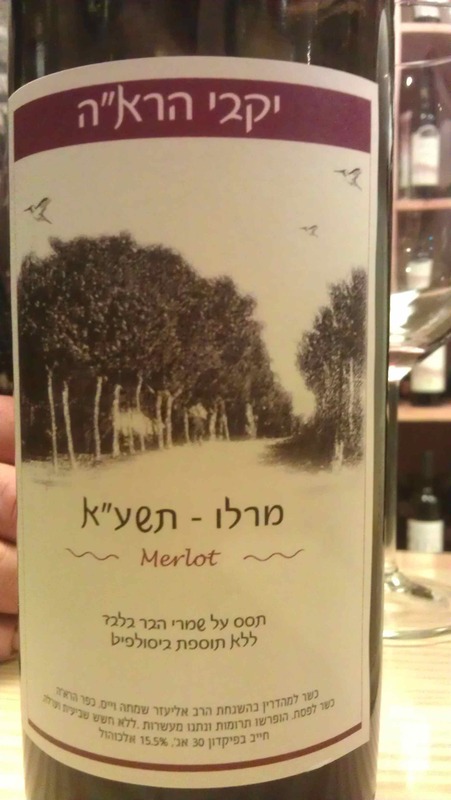 With all the overripe and over sweet 2009 wines from Israel – this is a wine that shows you what control in Israel can taste like. 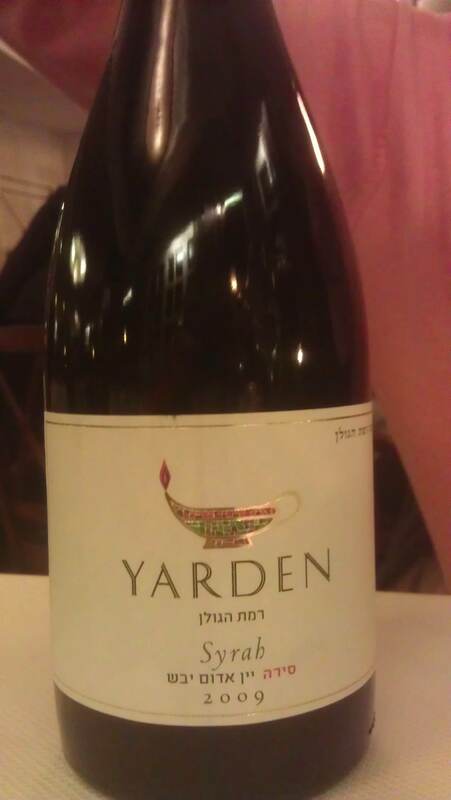 Before I left for Israel, I had a bottle of the 2008 Yarden Odem Vineyard Chardonnay. Normally this wine is killer. The 2009 vintage is lovely, the 2007 vintage was closed the last time I enjoyed it, but opened quickly enough and was lovely. Unfortunately, this bottle of the 2008 Yarden Odem Vineyard Chardonnay was clearly in a deep sleep, and one that would not open no matter what I tried. Humorously, when I came back from Israel, some three weeks later, the leftovers of the wine that I stored in the refrigerator, tasted quite nice! 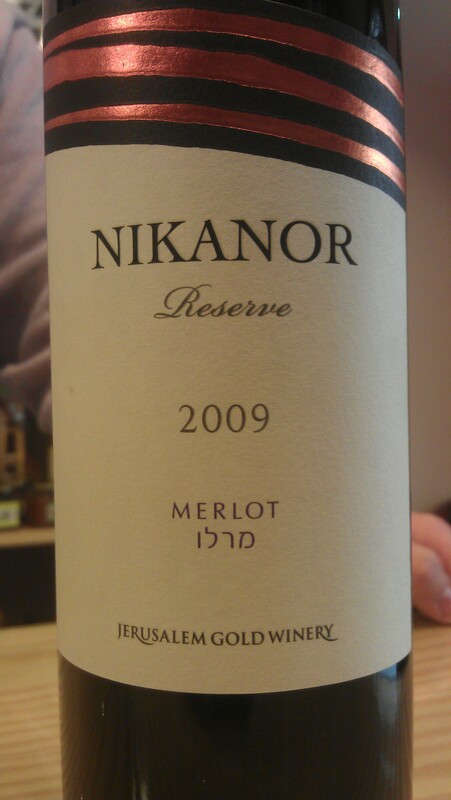 In Israel, we enjoyed many wines for Passover and for other meals. Some of the wines were quite nice while some were just OK. 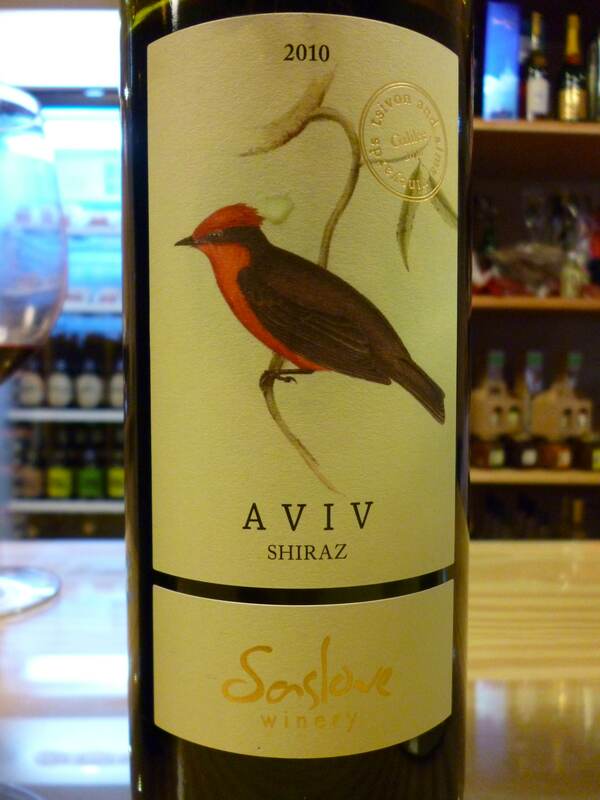 The best two wines we enjoyed were the 2010 Dalton Zinfandel and the 2010 Saslove April. The other wines were fine but none of those were really note worthy. The 2010 Dalton Zinfandel showed far better than when I had it at the Gotham Wine Event. 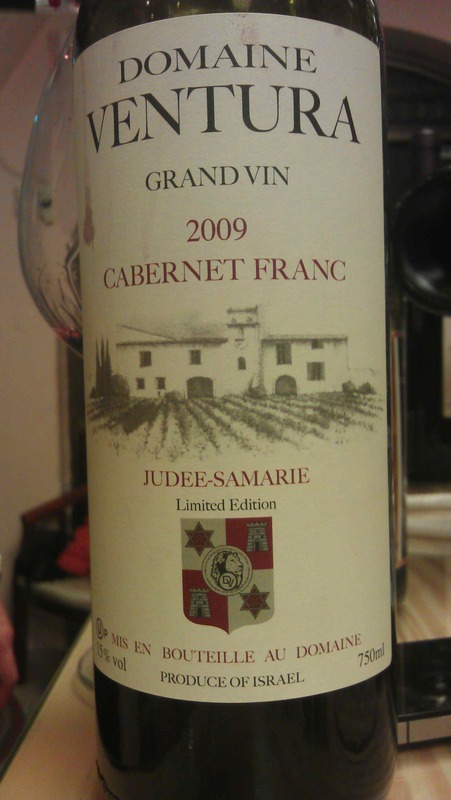 The Tulip White Franc was really nice, though a bit less Cabernet Franc-ish than the 2010 vintage. This is the second time I had the chance to taste April, when I enjoyed it at Sommelier last year, and it continues to impress with its light oak influence (they used staves) and interesting blend. The only real downer for me was 2011 Galil Rose; it was OK, but nothing to write home about. I was not a huge fan of the Dalton Roses either, but hey I keep trying! I do love the Flam and Catsel Roses. 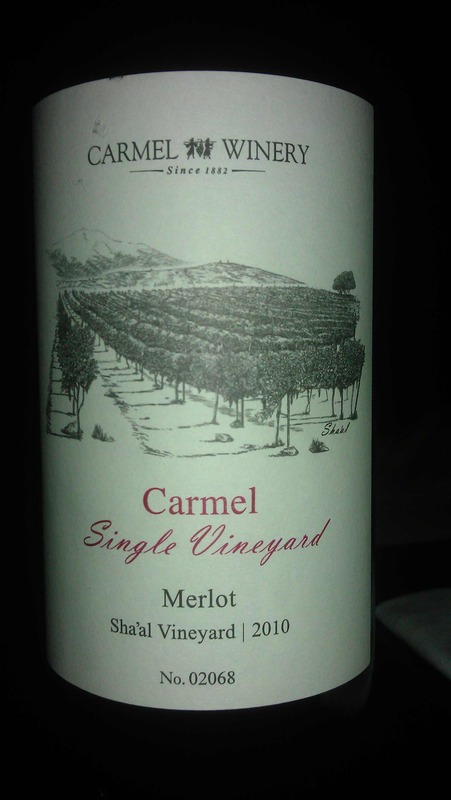 The Tulip Just Cab and Merlot were lovely and continue to improve and show good varietal characteristics. 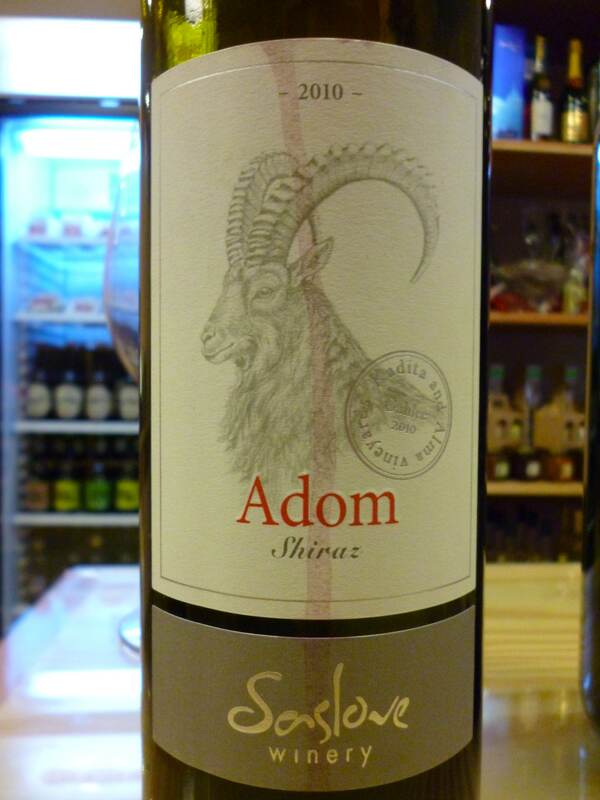 I had the 2010 Galil Wines and they were average at best, which is OK, but again not wines to write home about. My father-in-law and I both enjoyed the bubbly Cabernet. Yes, I said I liked a semi-sweet bubbly Cabernet, because it was actually enjoyable. Sorry, to all the wine snobs out there, but the 2011 Tabor Pnimim (Pearls) sparkler, was enjoyable, unpretentious, and though semi-sweet, not cloyingly so in any way. No, I would not normally, bestow any praise upon a semi sweet Cabernet nor even write about it in a positive manner, as normally Cabernet and sweet do not logically go hand in hand, but Tabor did a good job, so Kudos! This past week we spent time with friends and family and it was a lovely time for all. Family came in from out of town and we were excited to see them and spend time with them. We started the meal with Brazilian Black Bean Soup. We have made this soup a few times already and the recipe is from the classic Mollie Katzen Moosewood Cookbook. The soup hit the spot given the colder temperature that has hit our area. The Viognier was nice with Kiddush, but it is over my friends – drink up or cook with it. My hope is that the 2008 or 2009 Goose Bay Viognier is coming out soon. The Goose Bay Viognier was lovely for some time with a classic perfumed and flowered nose, but those days are well past and please heed my advice – drink up or dump it. Once the wine was gone, we moved on to another bottle – which may well have been the biggest surprise of the evening! Benyamin came by again this week and he brought a bottle of wine that I thought was going to be a total waste of time, but was more than happy to try out of sheer curiosity. In the end, it turned out to be my favorite wine of the evening. It was not the highest scoring wine, but it was the most enjoyable wine because it shocked me so and was downright tasty still after all of these years! The wine I am talking about is the N.A. 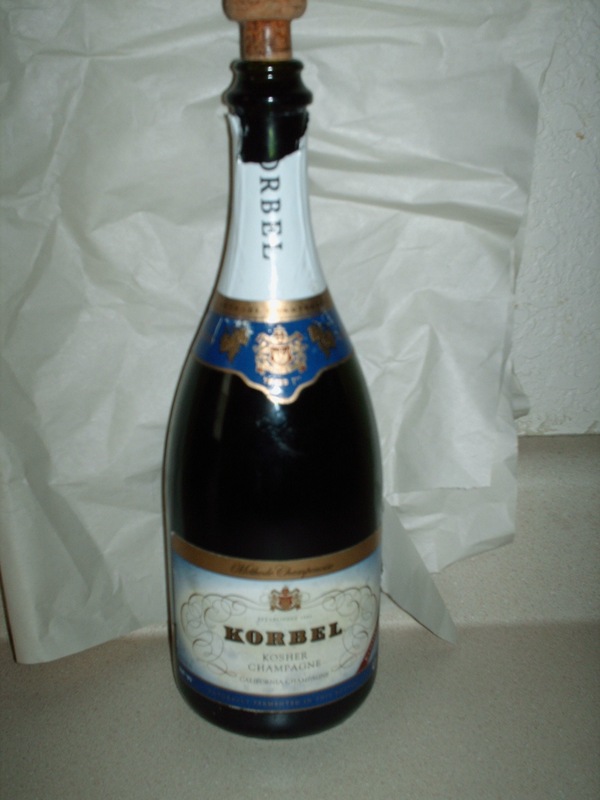 Kosher Korbel Brut Champagne from 1997! This puppy is more than 13 years old! This wine sold for 13 dollars at the time. The wine was all the rage in 1995 and the re-released with a different vintage in 1997. The wine was never released again after that, which was a shame, but for those two years the wine was great. I do not remember it very well from back then, but from what I remember, I was not a huge fan. That all changed last night! The bubbles were lovely and soft, the mousse was almost foamy with a continuous attack of effervescence that did not let up all night. The bottle disappeared quickly, but even the bit that we left to the side was wonderful throughout the meal. Following the sparkling wine and the soup, we moved on to the main course of Portabella Mushroom and Sweet Potato Risotto, Lemon Rosemary Pepper Flake Roasted Chicken Recipe, Cold Roasted Green Bean Salad, and Fresh Green Salad. To match these dishes, I pulled out an interesting pair of Yarden Chardonnay. Both of the wines hail from the 2007 vintage, a 2007 Yarden Chardonnay, and the 2007 Yarden Odem Vineyard Chardonnay. The wines were way too young and are not ready to drink – either of them. The wines were tight and not open, almost DOA out of the bottle. After a few hours, long after the meal was over, the wines were open and nice, but I do not think that even they are hitting their stride. These wines are way too young, maybe asleep, and need another year before they will show their best stuff. Right now my money would be on a Four Gates Chardonnay, if you are looking for a full bodied, fruity, and luscious California Chardonnay. We have tasted them in the past few months, both the 2004 and 2005, and they are both stunning. That said, in a year or a bit longer the two 2007 Yarden Chardonnay wines will be ready to party and show their white stripes. For dessert our friend brought us another masterpiece, Kahlua Chocolate Cake! The cake all but about disappeared, and that was because we pulled it from the table before that could occur. Our many thanks to our friends and family who joined us for the meal and who were very kind to share their wonderful cake and wine with us. This wine is on its way out 😦 The perfume is now gone. The nose on this light gold colored wine has grapefruit, lemon, slight floral notes, cut grass, smoky and tasty oak, honey, and citrus. The mouth on this medium bodied wine has lost its original oily and perfumed charm, now it has only a citrus body, with peach and pear along for the ride. The mid palate is bracing with acid, toasty oak, and lemon. The finish is long with more acid, caramel, straw, toasty oak, and lemon/grapefruit. It is a shame as this was once one of my favorites. I hope there is a new vintage coming out soon. This wine is from 1997! Are you kidding me! It was the second and final kosher run of the winery. The nose on this straw colored wine was filled with a yeast and mushroom nose, toast, herbs, asparagus, and lemon. The mouse on this medium bodied wine was filled out by the small bubbles of the lovely and still very alive mousse, toast, yeast, mushroom, and lemon. The mid palate was bracing with core acidity, and toast. The finish was nice along with more nice small bubbles, toast, mushroom, and lemon. It was a lovely wine that was drunk quickly and one that paired well with our hearty black bean soup. Really a shock that this 13 dollar wine survived this long and was more than acceptable! Kudos to Benyamin Cantz for keeping it so long and in such good quality, and for sure to Korbel for making a reasonably priced kosher wine that could live this long and taste maybe even better than I remember it tasting originally! This wine was closed and tight to start, it took it a good hour or two to come out of its shell. This wine is still not ready to enjoy at its fullest without a fair amount of up front effort. The nose on this lemon colored wine has butterscotch, butter, lemon, toasty oak, mint, pear, peach, and apple. The mouth on this full bodied wine has toasty oak, pear, peach, lemon, apricot, and apple. The mid palate is heavy with acid, toasty oak, butterscotch, and a touch of mint. The finish is long with more oak, butter, butterscotch, bright citrus, lemon, and toasty oak. The toasty oak, butterscotch, and lemon linger on the palate. This wine takes a very long time to open up – clearly not it’s time to be drunk yet. Once it opens, the nose on this gold colored wine is filled with toasty oak, honey, ripe fig, caramel, butter, spice, rose notes, apple, grapefruit, and lemon. The mouth of this full bodied wine is mouth filling with ripe fig, apple, grapefruit, lemon, cloves, and toast. The mid palate is balanced with bight acidity, caramel, butter, and spice. The finish is long with more toast, oak, ripe figs, right citrus, and butter. This is a lovely wine, but not yet ready to show its best stuff. Leave this one alone for a year and come back.